How to choose a security chain, mooring chain or decorative chain? There are many different types of chain to choose from and for best results, it is important to select the right type and quality of chain for any given application. Commonly available chains include: security chains, mooring chains, decorative chains, etc. Each type will be designed to incorporate features appropriate to the type of application for which they will be used. Decorative chains are often used for museum displays such as dungeon or maritime scenes, to define garden boundaries, as well as for a host of other applications. Key design criteria will centre around general appearance, but may include other criteria such as low cost or low weight. Some decorative chains are even manufactured from not metallic materials such as polypropylene or other plastics which can be produced to offer anything from a highly decorative finish to the appearance of an aged and rust pitted anchor chain. The qualities of a mooring chain must include high tensile strength and a degree of ductility or elasticity of its links to accommodate the stresses imposed by the constant movement of a ship or boat at anchor. Mooring chains will typically be galvanised for maximum corrosion resistance and whilst robust in many ways, are relatively easy to cut through. A security chain by definition, must offer protection against human instigated attack such as; sawing attack, bolt cropper attack, freezing attack, etc. Chains offering token or low level security are generally available from larger DIY stores, however for expert advice on the right type of chain for your needs, the best option is to approach a specialist security supplier. A specialist supplier will also be able to offer you a choice of chains covering all levels of security. There are four main factors which combine to determine the level of security offered by a chain; the diameter of the chain link section, whether the alloy steel links are welded, whether the links are case hardened and / or through hardened. -Naturally the thicker the cross section of a chain link, the more difficult it will be and the longer it will take to cut or break (where other factors are equal). -Welded links are those where the two ends of the link are welded together to form a closed section. Welded links protect against the link simply being prised apart. -Case hardening is a process that develops a very hard surface to the link. This prevents any bite by a saw blade, offering effective protection against saw attack. -Through hardening is a process that makes the steel alloy of the link harder throughout its interior, thus increasing resistance of the links to bolt cropper type attack. Over-hardening however can result in links becoming brittle and more vulnerable to freezing attack. The best security chains are therefore manufactured to achieve an effective balance between the hardness and the ductility of the steel alloy of the links to ensure maximum protection against both cropping and freezing attacks. The overall effectiveness of a security chain against attack therefore will depend on the mix of the above factors. 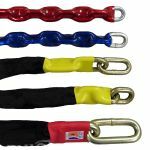 Here are just a few links to our best high security chains along with high security padlocks and anchors. What level of security chain do you need? Token gesture security can be achieved with any chain that does not feature welded links, or has a link section of less than 8mm diameter and is not at least case hardened can only be considered as a token gesture toward security. This may be enough, in some circumstances, to discourage would be thieves and attacks. Low level security, welded link, case hardened chains up to 8mm diameter link section should be considered as offering low level security. Such chains are often used for securing bicycles, lawn mowers and other garden equipment or furniture, etc. Medium level security, welded link, case and through hardened chains up to 10mm diameter link section offer medium level security. Such chains are often used for securing gates, motor scooters, lower cost ride on lawn mowers, etc. High level security, welded link, case and through hardened chains of 11mm or over in link section diameter offer higher level security. Such chains are often used for securing expensive motorcycles, caravans and boat trailers, etc. during lay ups and for any other applications where higher levels of security are a requirement. Popular chains in this range feature link sections of 11 to 13mm diameter (offers a convenient security : weight ratio), although larger sizes are also available. To protect the items being secured from abrasion or other damage by the chain, many chains are available with an optional protective PVC or special nylon / cloth sheathing. Typically the sheathing option is restricted to chains up to 2 metres in length. `Super Link` (long link) chains feature an extended end link (or may be manufactured entirely from extended links). An extended link is one which will allow another link of the chain to pass though it and may be an essential requirement where the chain is to be used with a closed shackle padlock which may not have a wide enough jaw to accommodate two links. Don`t forget any security solution is only as good as the weakest link or element. It is important therefore that your padlocks, and if appropriate your security hasps or ground anchors etc. need to offer a similar level of security to that offered by the security chain. Many security chains are independently tested and approved to one of the various Sold Secure (Gold, Silver or Bronze classification) standards.